Abseiling down a cliff face head first combines the Adrenalin pumping thrill of bungy with the control of abseiling. 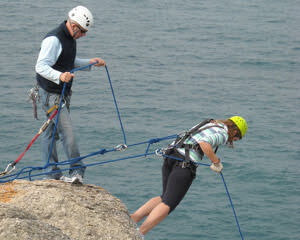 Abseiling down a cliff face head first combines the Adrenalin pumping thrill of bungy, with the control of abseiling. For anyone who finds normal abseiling a bit tame, Forward Abseiling is the Adrenalin roping sport! Located at the spectacular cliffs around Victor Harbor, 90 minutes south of Adelaide. The 3 hour session commences with a full safety briefing and introduction to the equipment and techniques then get right into abseiling. Initially you will forward run down a simple small cliff so you get the skills up for the next step, a 15 metre cliff with an over hang. Not for the faint of heart - this is an adventure for the real thrill seeker! Participants must have a reasonable level of fitness (ie should be able to walk briskly for 20 minutes with out being out of breath).